Boarding school student Tiara Douglas from Titjikala recently travelled to Canberra to participate in the Heywire Regional Youth Summit. The summit, now in its 20th year, attracted 54 students from across the country who developed proposals and pitched their ideas for positive community change to community leaders, senators, members of parliament and media at Parliament House. At the forum Tiara shared her story about ‘leaving my remote community for boarding school,’ which describes the challenges she faced when transitioning from her remote community school to boarding school. Her submission was one of nearly 700 entries, portraying obstacles overcome to achieve success, and depicting cultural pride. 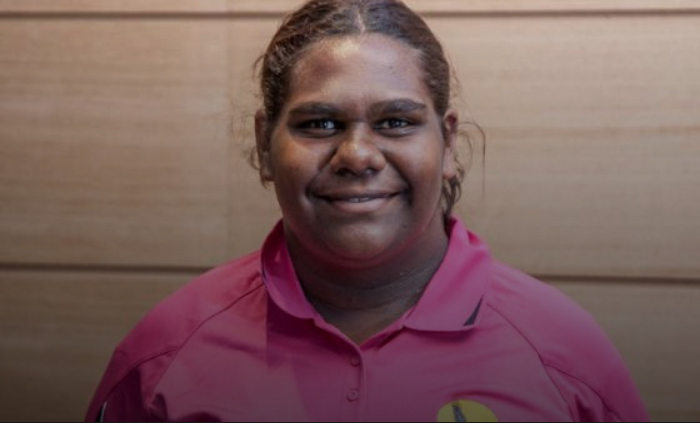 “I moved a very long way from home to attend boarding school at Worawa Aboriginal College in Healesville, Victoria,” she said. Tiara’s story also highlights the connection she enjoys whenever she returns home to Titjikala. “Now when I go home to Titjikala in the holidays and I love seeing my sisters and the rest of my family. I love the warmth and going swimming out in the dams,’’ she said. Tiara was supported by the Transition Support Unit, which assists boarding students and families throughout the Territory to make a smooth and successful transition to boarding school. In 2017, the Transition Support Unit serviced 78 remote schools and assisted 1900 NT students from 250 different NT locations to attend boarding school in 2017.